Ice Fire SJ287 Fleece Figure Skating Jacket - Color Layback. 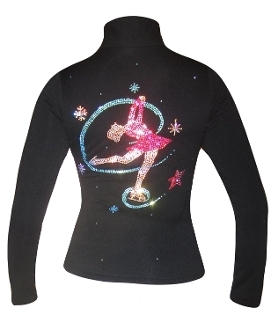 The Ice Fire SJ287 Fleece Figure Skating Jacket features a layback spin design composed of colorful rhinestones in three colors (AB, aqua and red). Made from Polartec power stretch fabric with a fitted style and no hood. Choose from Child XS - Adult L. Click on images to view sizing chart.